Topic 1: What is Feed Forward? A future focused way to get feedback for improvement. Simple three step process that focuses on the future, where you ask others for ideas for improvement. 2. ASK & LISTEN – ASK: “I’m focused on doing a better job of (insert focus area here). Do you have any ideas or suggestions for me?” LISTEN to EVERY suggestion without defensiveness or push back. GOAL:-Get as many ideas as you can. 3. 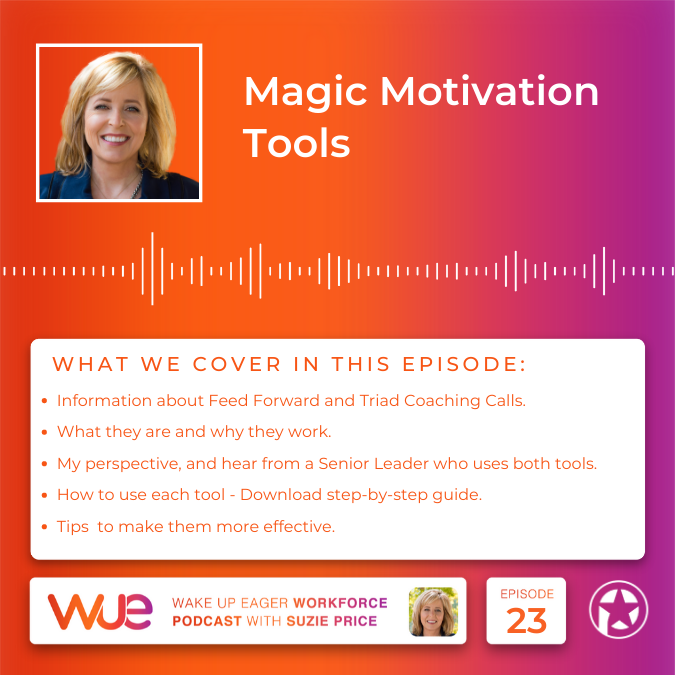 FOLLOW UP- determine top themes – use them as your development and in a coaching process (create a Dashboard top 3 to 5 priorities) See more about the Dashboard Podcast #20 Also follow up by reporting back to the people who gave you feedback – what you’re working on. Why it's magic... my experience. First discovered it in this book: What Got You Here Won't Get You There: HOW SUCCESSFUL PEOPLE BECOME EVEN MORE SUCCESSFUL. - Fourth Call - Feed Forward Themes discovered and a Dashboard is created. What is it? Three way call with me, a manager and employee who’s completed a TriMetrix Assessment. Usually my second coaching call with a person who’s being coached and/or received an assessment. 60 minutes. Employee and Manager Agenda in advance. STAY IN TOUCH: Are you a leader, trainer or consultant focused on building a Wake Up Eager Workforce? Subscribe to this Podcast Here. You can also sign up for monthly email updates, here. Thank you for being a part of the Wake Up Eager Workforce Podcast! !